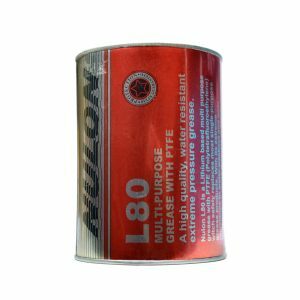 Nulon L-80 Grease is a unique and innovative blend of activated PTFE (Poly Tetra Fluoro Ethylene) propriety additives and Lithium based water repellent grease. Being compatible with most existing lubricants, L-80 can be safely used in almost any greasing application to improve lubrication and reduce temperature and wear and tear. Nulon L-80 Grease is a versatile product as it has a vast variety of applications ranging from Industries, Trucks/Trucks, Buses, Construction equipment/machineries etc. This multi-purpose L-80 grease inculcates PTFE particles that are in the sizes of sub-microns and hence tend to get finely and evenly dispersed. The activated PTFE forms an active protective film on all the metal surfaces and parts of the inner hub & bearing thereby giving protection and enhancing lubrication by eliminating friction to near zero levels. The film prevents direct metal to metal and protects the surfaces from wear and tear. L-80 grease successfully keeps the water and dust out owing to the plating of PTFE applied to the mating surfaces and working conditions. Seal performance is improved and operating temperature reduced, resulting in less grease “throw”. L-80 is applicable to the majority of situations specifying grease lubrication, especially in high pressure, water and salt water conditions including wire ropes. L-80 has a continuous temperature operating range of -20 centigrade to +260 centigrade and an intermittent or short term use upto 240 centigrade. L-80 provides a residual lubrication which provided added insurance combined with savings through less wear and down time, making it an economical benefit. It ensures smoother running, increased efficiency, prolonged machinery life, less labour and less volume of lubricant, all of which indicate higher profits. Continuous application of L-80 prevents seizing and pitting on the friction surfaces. Nulon Grease can be used in any greasing application to reduce friction, improve lubrication, reduce operating temperatures, wear & tear and extend bearing life and for saving power/fuel. It is highly recommended for use in areas subjected to extreme pressure, high load, high speed and high temperature. For truck, buses and other heavy equipment of Telco, Ashok Leyland and other manufacturers, Nulon L-80 grease is ideal for use on the wheel bearings of front and rear hubs. In comparison to other greases which have a life of less than 20000 kilometres, Nulon grease protects the bearings from damage and extends its life cycle by at least six times and can be refitted/used even after 125,000 Kms. This grease was tested by M/s Vijayanand Road Lines Ltd. Hubli, a fleet owner with more than 1500 vehicles. Enclosed are two certificates from them certifying the product along with cost benefit analysis (VRL CERTIFICATES 1 and 2 enclosed). Vijayanand Road Lines Ltd. are now regularly using our Nulon L-80 Grease in their vehicles. The below list is only indicative of the applications of L-80 Grease. VEHICLES:- Universal joints, Wheel bearings, Leaf Springs, Kingpins Chassis, Tow Balls, Water pumps, Turn-tables, Clutch release Bearings, Ball Joints. MARINE EQUIPMENT:- Sump and bilge pumps, Deck winches, Trawl ropes, Boat trailer bearings, Outboard fittings, Stern tube Bearings, Propeller Shafts, Anchor winches Rudder post bearings. MISCELLANEOUS: – Cables, Bearings, Bushings, Guides, Cams, Valves, Slides, Pumps, Mining equipment, Conveyors, Farm Machinery Production Equipment. 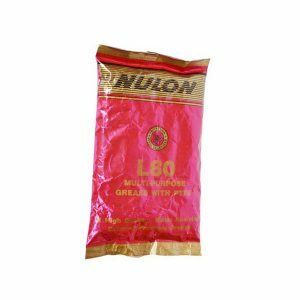 Nulon L-80 Grease is available in different packing of 200Gm, 1Kg, 5Kg, 25Kg & 182 Kg Drum. These specifications are based on tests and practical experience. Nulon highly recommends practical trials of Nulon L-80 PTFE based Grease.